My obsession with bread started after I stopped eating it. I went on a keto diet a few years ago and changed my eating habits dramatically. My husband and I gave up bread and pasta entirely (among other things). It wasn’t as difficult as it seemed, because we felt so much better, lost a few pounds and had tons more energy. But then there was the toast. One day a few months into our new diet, my son asked for some toast for breakfast. I found a package of bread in the back of the refrigerator, a brand I used to buy because it was labeled whole wheat and came at a premium price. Seemed healthy enough. The bag held a few lonely slices that upon closer inspection looked fine, but when I checked the label, I saw that it had expired not days before, but months. More than 3 months to be exact. But it still looked perfect. Gross. Admittedly I needed to clean out my fridge more often, but my disgust moved me to action. Into the bin went the old bread, my son ate cereal, and my mind was made up: If I could cook, I would try to bake all our bread. Or at least most of it. Thus began my journey. I’d always been a baker, but hadn’t dabbled much in bread. I started with some basic white and whole-wheat loaves, leavened with yeast. They were OK. I made loaf after loaf. We ate some, I gave away others. They were not so great, and then they got better. Even good. Then a friend gave me some of her sourdough starter and things got serious. I named the starter Rose. I fed her flour and water and she bubbled up, full of life. I experimented with various sourdough methods. I took books out of the library, poured over variations and learned about leavens and bulk rising and proofing and shaping. I discovered how important time and temperature are in the process. Despite my avoidance to carbs, I still felt great when I ate the bread that I made. Two years later, I’m obsessed. Not just to the pleasures of eating bread, although there is that, but to the whole challenge and delight of making it. I don’t know if bread baking will replace chiropractic or yoga for me, but it is a soothing respite from, pardon the pun, the daily grind. Making bread lets me get my hands dirty, to be present, to feel the warmth of the water and the flour and how it changes over time from a sticky mass to a smooth and silky dough. I stretch the dough, watch it rise, brush the flour off the top. I put it into the oven and hope for the best. Well-baked breads crackle and pop and sing while they cool, and I listen eagerly. Cutting into a fresh loaf is always a thrill, and tasting that first piece is a chance to see it all come together. Or not. And then I try again. Each loaf I make is a little bit science, a little bit creative expression, a little bit luck. It feels magical somehow. It rewards focus and punishes multitasking. Bread has opened up my world far beyond my kitchen as I never expected. I’ve met fellow artisans and they’ve been generous with their experience and advice. I have discovered a whole economy of grain and the farmers who grow it. I started teaching baking classes in my home and I love passing on what I’ve learned and seeing my students bake for their families. As much as I love making and eating bread, sharing what I make is the most rewarding part. When someone tells me they crave chocolate, I know they’ll love the chocolate sourdough I bake studded with dried cherries, and they do. For fall I worked on a pumpkin version, fragrant with warm spices, and it was a hit with my latest bread class. I can’t wait to use my bread in stuffing this Thanksgiving and share gooey cinnamon rolls on Christmas morning. I keep a sourdough starter in the fridge at my mom’s house in Florida and I bake for her when I’m home. 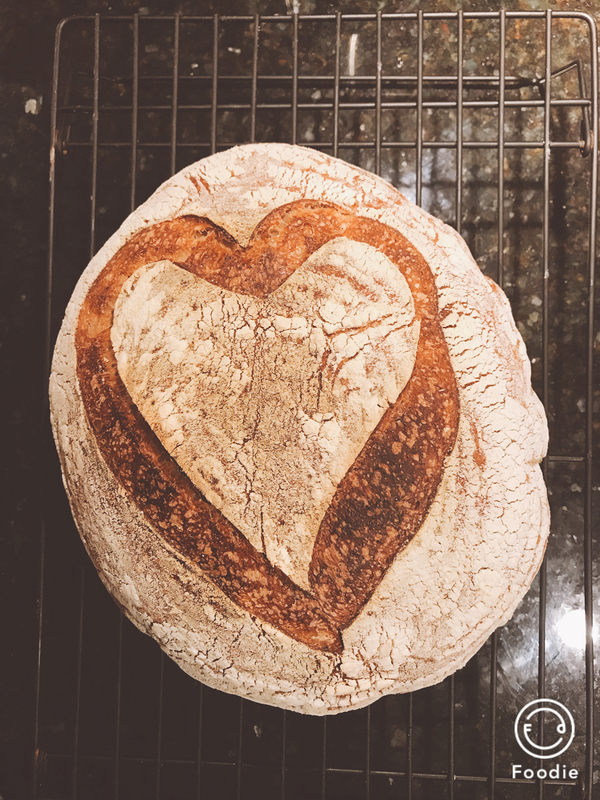 It’s easy to love bread, for all its magic and deliciousness; for its culture of generosity and love. If I like you, I’ll bake for you. And it will feed us both, body and soul. This essay originally appeared in Fete Lifestyle Magazine, November 2018.